What does endodontics stand for? The word endodontics derives from the Greek word “endodont” and analogously means “that which is inside the tooth” – that basically is the nerve of the tooth (also known as pulpa). The tooth nerve is located inside the tooth and reaches down the root canal to the root tip. How can a tooth root get inflamed? The most common cause of an inflamed tooth nerve, is bacteria which accumulate due to tooth decay and later also affects the exposed pulpa. This usually results in an inflamed root canal. An inflamed tooth nerve can be extremely painful and the reason for the tooth to die. 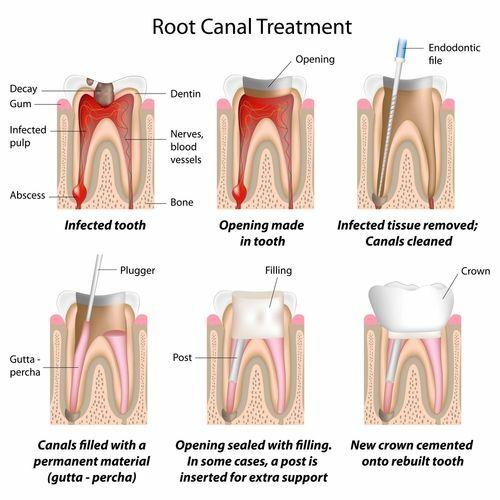 A root canal procedure can save the affected tooth and preserve its functionality. How can you treat a diseased tooth or infected nerve? Extracting the tooth -This option leaves a tooth gap, and, if not closed fast enough, can cause the surrounding teeth to shift. Misaligned teeth can cause unpleasant jaw, neck and back pain. Saving your tooth with a root canal procedure - When performing a root canal treatment, it is most important to get rid of all bacteria and infection from the coronal pulp chamber and its associated canals, to prevent infection from recurring and the pain that is associated with it. To stop the inflammation of a tooth nerve and the treatment to be successful, all the debris, bacteria and infection from the coronal pulp chamber and its associated canals have to be removed and the area thoroughly cleaned. An early detection and immediate treatment of an infection can prevent the possibility of losing the tooth. Course of a root canal treatment: first the root canal is drilled out. The tooth nerve is removed and cleaned with special instruments. After disinfecting, the root canal is filled with a self-setting paste and closed again. In our dental practice in Spain the root canal procedure is carried out with the most modern techniques (machine-based reprocessing and electronic length measurement). It is extremely important to detect and clean all affected root canals, down to the root tip. Our high success rate confirms that we constantly succeed in this. We perform root canal treatments with the help of the very well-known system “Maillefer Wave one” and a “Zeiss” magnifying glass. To prevent bacteria from settling again, the pulp chamber down to the root nerves get filled with a self-setting paste and is then tightly closed. Getting rid of all bacteria and infections is essential for a root canal treatment to be successful. If you suffer from toothache do not wait too long before contacting your dentist. An early examination of your tooth raises the chances of a successful caries treatment or of a possible root canal procedure significantly.